Carter House Inns (800) 404-1390, (707) 444-8062. $$-$$$+. Afternoon & evening snack; full breakfast; restaurant; room service. Pets ok in some rooms. ●Hotel Carter 301 L St. 24 rooms. Some gas fireplaces. 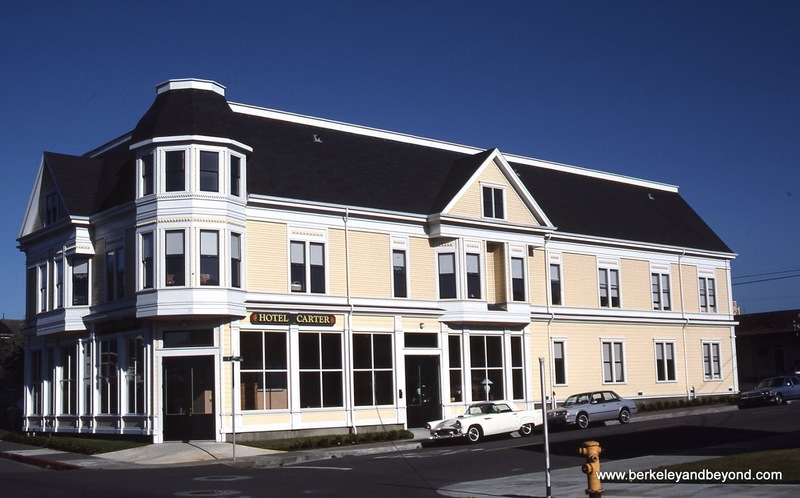 The center of this little empire, this hotel was built in 1984 to replicate a long gone Victorian inn originally located in the area. It provides casual, tasteful lodging amenable to families. Some suites have showers for two and in-room whirlpool tubs large enough for a family of four. When staying in one of these posh rooms recently, I’d set my alarm so I’d have enough time to enjoy a leisurely soak before my 8:30 a.m. breakfast time. It was at 7:30 a.m. that I glimpsed a card requesting that guests please not use the tub between 10 p.m. and 8 a.m. What’s a girl to do? I ran the whirlpool tub at 7:15 a.m.--it was just too good to pass up, being one of the deepest tubs I’ve come across--and I regretted nothing once the perfectly operating jets started soothing my overused tootsies. I plead “rules are made to be broken.” Oh, and did I mention the abundance of fluffy white towels everywhere? Restaurant 301 offers an elegant dinner menu showcasing the region’s finest seasonal delicacies, including Kumamoto oysters and Pacific salmon. Designed to please both the eye and the palate, entrees are arranged artistically on oversize plates and garnished with such delights as fresh flowers and herb sprigs. Past menu selections have included flavorful squash cakes, chicken cacciatora with creamy polenta, and grilled pork loin with both housemade chutney and applesauce. A well-priced five-course, fixed price dinner is available with optional selected wine pairings. Bar drinks are available as well as several thousand wines, including vintages from Envy Wines, the proprietor’s winery in Calistoga. Breakfast for the inns is provided here and includes a pastry buffet and a hot egg dish served to the table. Interested guests may visit the herb and vegetable garden that supplies the restaurant. It is the most extensive inn kitchen garden on the West Coast. In the late afternoon complimentary wine and hors d'oeuvres are served in the lobby, and in the evening freshly baked cookies and tea appear. Just remember that if you want a chocolate and turndown, you need to request it. The owner’s substantial collection of original local art is displayed here and throughout the lodgings, and an impressive wine shop operates off the lobby. ●Carter House 1033 3rd St./L St. 4 stories; 6 rooms. Unsuitable for toddlers. 1 fireplace. When constructed by then and current owner Mark Carter in 1982, this Victorian-style building was the original Carter House. Its redwood exterior was ominously weather-darkened, and it looked like it had been here forever, but now it is painted an inviting cheery yellow. It is surprising to learn it is a replica of the 1884 Eastlake Victorian design of two San Francisco architects, one of whom also designed Eureka’s famous Carson Mansion. 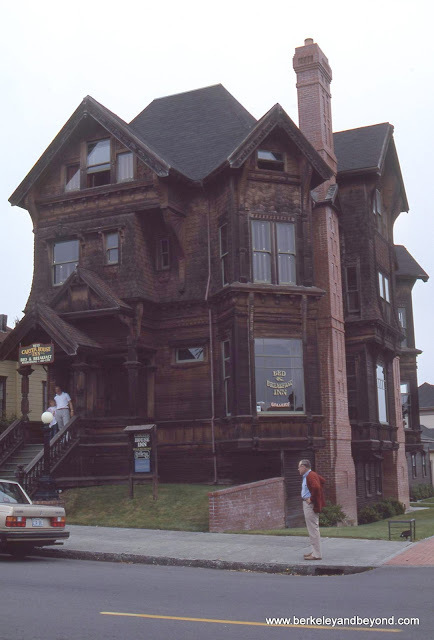 (The original house stood on the corner of Bush and Jones streets in San Francisco and was destroyed in the fire following the 1906 earthquake.) Rooms are all oversize and elegantly furnished. ●Bell Cottage 1023 3rd St. 3 rooms. Shared kitchen; some wood-burning & gas fireplaces. ●Carter Cottage 1027 3rd St. 1 room. Kitchen; 2 gas fireplaces. Located adjacent to the Carter House, these sweet Victorian cottages offer a little more privacy and independence. Each suite in the 1890 Bell Cottage has a marble fireplace plus a private bath and whirlpool tub. Carter Cottage features a deep marble whirlpool tub, fireplaces in both the sleeping and living areas, and a secluded back deck with a fountain plus a marina view. More things to do in Eureka.